A handful of US scientists have made names for themselves by casting doubt on global warming research. In the past, the same people have also downplayed the dangers of passive smoking, acid rain and the ozone hole. In all cases, the tactics are the same: Spread doubt and claim it’s too soon to take action. 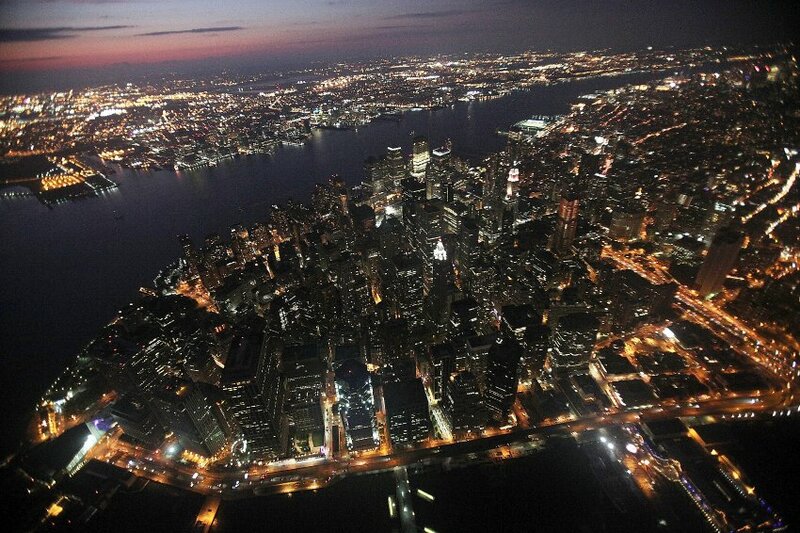 Photo: Manhattan by night: The skeptics are accused of having links to energy companies. With his sonorous voice, Fred Singer, 86, sounded like a grandfather explaining the obvious to a dim-witted child. “Nature, not human activity, rules the climate,” the American physicist told a discussion attended by members of the German parliament for the business-friendly Free Democratic Party (FDP) three weeks ago. Marie-Luise Dött, the environmental policy spokeswoman for the parliamentary group of Angela Merkel’s center-right Christian Democratic Union (CDU), also attended Singer’s presentation. She said afterwards that it was “extremely illuminating.” She later backpedaled, saying that her comments had been quoted out of context, and that of course she supports an ambitious climate protection policy — just like Chancellor Merkel. Singer is a traveling salesman of sorts for those who question climate change. On this year’s summer tour, he gave speeches to politicians in Rome, Paris and the Israeli port city of Haifa. Paul Friedhoff, the economic policy spokesman of the FDP’s parliamentary group, had invited him to Berlin. Singer and the FDP get along famously. The American scientist had already presented his contrary theories on the climate to FDP politicians at the Institute for Free Enterprise, a Berlin-based free-market think tank, last December. Singer is one of the most influential deniers of climate change worldwide. In his world, respected climatologists are vilified as liars, people who are masquerading as environmentalists while, in reality, having only one goal in mind: to introduce socialism. Singer wants to save the world from this horror. For some, the fact that he made a name for himself as a brilliant atmospheric physicist after World War II lends weight to his words. It almost seems as if Singer were trying to disguise himself as one of the people he is fighting. With his corduroy trousers, long white hair and a fish fossil hanging from a leather band around his neck, he comes across as an amiable old environmentalist. But the image he paints of nature is not at all friendly. “Nature is much to be feared, very cruel and very dangerous,” he says. At conferences, Singer likes to introduce himself as a representative of the Nongovernmental International Panel on Climate Change (NIPCC). As impressive as this title sounds, the NIPCC is nothing but a collection of like-minded scientists Singer has gathered around himself. A German meteorologist in the group, Gerd Weber, has worked for the German Coal Association on and off for the last 25 years. According to a US study, 97 percent of all climatologists worldwide assume that greenhouse gases produced by humans are warming the Earth. Nevertheless, one third of Germans and 40 percent of Americans doubt that the Earth is getting warmer. And many people are convinced that climatologists are divided into two opposing camps on the issue — which is untrue. So how is it that people like Singer have been so effective in shaping public opinion? Many scientists do not sufficiently explain the results of their research. Some climatologists have also been arrogant or have refused to turn over their data to critics. Some overlook inconsistencies or conjure up exaggerated horror scenarios that are not always backed by science. For example, sloppy work was responsible for a prediction in an Intergovernmental Panel on Climate Change (IPCC) report that all Himalayan glaciers would have melted by 2035. It was a grotesque mistake that plunged the IPCC into a credibility crisis. In 1993, the US Environmental Protection Agency (EPA) published what was then the most comprehensive study on the effects of tobacco smoke on health, which stated that exposure to secondhand smoke was responsible for about 3,000 deaths a year in the United States. Singer promptly called it “junk science.” He warned that the EPA scientists were secretly pursuing a communist agenda. “If we do not carefully delineate the government’s role in regulating … dangers, there is essentially no limit to how much government can ultimately control our lives,” Singer wrote. Singer, Marshall Institute founder Fred Seitz and Patrick Michaels, who is now one of the best known climate change skeptics, were all advisers to TASSC. The Reagan administration also appointed Singer to a task force on acid rain. In that group, Singer insisted that it was too early to take action and that it hadn’t even been proven yet that sulfur emissions were in fact the cause. He also said that some plants even benefited from acid rain. After acid rain, Singer turned his attention to a new topic: the “ozone scare.” Once again, he applied the same argumentative pattern, noting that although it was correct that the ozone concentration in the stratosphere was declining, the effect was only local. Besides, he added, it wasn’t clear yet whether chlorofluorocarbons (CFCs) from aerosol cans were even responsible for ozone depletion. As recently as 1994, Singer claimed that evidence “suggested that stratospheric chlorine comes mostly from natural sources.” Testifying before the US Congress in 1996, he said there was “no scientific consensus on ozone depletion or its consequences” — even though in 1995 the Nobel Prize had been awarded to three chemists who had demonstrated the influence of CFCs on the ozone layer. It soon looked as though there were a broad coalition opposing the science of climate change, supported by organizations like the National Center for Policy Analysis, the Heartland Institute and the Center for Science and Public Policy. In reality, these names were often little more than a front for the same handful of questionable scientists — and Exxon funded the whole illusion to the tune of millions of dollars. It was an excellent investment. Singer’s comrade-in-arms Patrick Michaels waged a particularly sharp-tongued campaign against the phalanx of climatologists. One of his books is called: “The Satanic Gases: Clearing the Air about Global Warming.” Michaels has managed to turn doubt into a lucrative business. The German Coal Association paid him a hefty fee for a study in the 1990s, and a US electric utility once donated $100,000 to his PR firm. Both Michaels and Ebell are members of the Cooler Heads Coalition. Unlike Singer and Seitz, they are not anti-communist crusaders from the Cold War era, but smooth communicators. Ebell, a historian, argues that life was not as comfortable for human beings in the Earth’s cold phases than in the warm ones. Besides, he adds, there are many indications that we are at the beginning of a cooling period. The professional skeptics tend to use inconsistent arguments. Sometimes they say that there is no global warming. At other times, they point out that while global warming does exist, it is not the result of human activity. Some climate change deniers even concede that man could do something about the problem, but that it isn’t really much of a problem. There is only one common theme to all of their prognoses: Do nothing. Wait. We need more research. Ebell faces more of an uphill battle in Europe. In his experience, he says, Europe is controlled by elites who — unlike ordinary people — happen to believe in climate change. But Fred Singer is doing his best to change that. He has joined forces with the European Institute for Climate and Energy (EIKE). The impressive-sounding name, however, is little more than a P.O. box address in the eastern German city of Jena. The group’s president, Holger Thuss, is a local politician with the conservative Christian Democratic Union (CDU). Hans Joachim Schellnhuber, director of the respected Potsdam Institute for Climate Impact Research and an adviser to Chancellor Merkel on climate-related issues, says he has no objection to sharing ideas with the EIKE, as long as its representatives can stick to the rules of scientific practice. But he refuses to join EIKE representatives in a political panel discussion, noting that this is precisely what the group hopes to achieve, namely to create the impression among laypeople that experts are discussing the issues on a level playing field. Ultimately, says Schellnhuber, science has become so complicated that large segments of the population can no longer keep up. The climate skeptics, on the other hand, are satisfied with “a desire for simple truths,” Schellnhuber says.